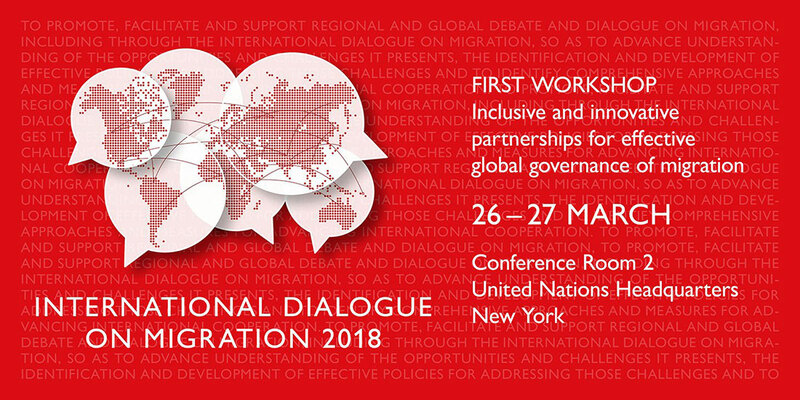 As Member States negotiate a global compact for safe, orderly and regular migration (GCM) to be adopted at the end of 2018, IOM, the UN Migration Agency, will continue to support the GCM development process by dedicating two workshops of its International Dialogue on Migration to the topic of inclusive and innovative partnerships for effective global governance of migration. The first workshop of the IDM will be held Monday through Tuesday at the United Nations (UN) Headquarters in New York. The IDM forum will also include representatives of civil society, migrants’ groups, experts and other stakeholders. It provides an informal and non-binding setting in which all stakeholders have an equal right to participate, fostering trust, openness and genuine exchange while addressing the full range of migration issues and their linkages with other policy domains. IOM recognizes the paramount importance of cooperation and has been working in close partnership with all relevant stakeholders, including fellow UN agencies in all these areas. As a result, many cooperation frameworks and tools have been developed jointly with UN Agencies and other partners. These tools are made available by IOM and partner agencies for the development and adoption of a global compact, and subsequently for the implementation and follow-up stages. During the 2017 IDM, IOM Director General William Lacy Swing pointed out that international cooperation should involve all relevant actors: national and local governments; multiple ministries; civil society; the private sector, migrant and diaspora organizations; academia; the media; and others. In addition, the importance of partnerships in migration, at all levels, was a key takeaway from the GCM stocktaking meeting, held in Puerto Vallarta, Mexico in December 2017. At this year’s IDM, discussions will explore different partnership models that exist in the field of migration and showcase their value by presenting some of the migration management tools developed through cooperation among different actors. Participants will have the opportunity to exchange good practices and experiences on successful and inclusive partnerships at local, national, regional and international levels, evaluate both achievements and challenges encountered, and consider what can be done to replicate and scale up such partnerships elsewhere. It is against this backdrop that the IDM will provide States, United Nations agencies and other partners an opportunity to demonstrate good partnership and coordination of efforts and discuss ways to improve collaboration. The IDM forum will include civil society, migrants’ groups, experts and other stakeholders.